Between the two World Wars, there was an unprecedented need for new houses in Britain which resulted in a building boom. While only a small percentage of this building took the form of Modernism, there was still a significant number of semis and terraces built for the workers and middle-class families in the 1920s and 1930s built in this style. 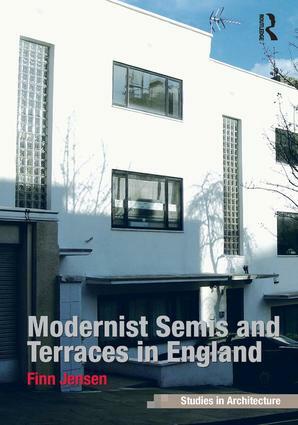 This book examines these modest Modernist houses within the broader context of the Modern Movement in Europe, as well as the inter-war building boom in suburban Britain. Illustrated with line drawings and photographs of more than 30 examples from around the country, and based on little-known contemporary material such as catalogues, advertisements, radio broadcasts and letters, it shows how these houses speak of a time of political, social and artistic unrest, and a world where the avant-garde architects sought to capture the spirit of modern technology in their designs for the average home owner. While the Modernist houses never became popular with the general public, the fact that so many are still standing and now sought after by twenty-first century families speak for their endurance and special appeal. Contents: Preface; Part I Architectural Modernism: Towards modernism in England. Part II Working-Class Estates: The Clockhouse Way estate - Braintree; Crittall's Garden Village - Silver End; The Bata estate - East Tilbury; Lescaze at Dartington Hall; Estates for war workers; Jellicoe's seven secret estates. Part III Modernist Housing - The Inter-War Period: The rise of modernism in continental Europe (1900-1940); Housing in inter-war England; Modernism and its critics - England in the 30s. Part IV Middle-Class Modernism - a Journey Through England: Introduction; Greater London - northern part; Greater London - southern part; The coastline from Cornwall to Essex; Inland locations; Modernism, Art Deco and the suntrap house. Part V Post-War Modernism: Introduction; Modernism 1945-65; The wilderness years and a new Modernism 1965-2010; Appendices; Bibliography; Index. Finn Jensen completed an MA in architecture at Liverpool John Moores University in 2006 following a career in the quality and reliability assurance of electronics. He is a doctorate and the author or co-author of three books within this field. Following his retirement as a consultant in 2004, he has devoted his time to the study of domestic architecture, especially in the UK, and is now a full time researcher and writer. The discipline of Architecture is undergoing subtle transformation as design awareness permeates our visually dominated culture. Technological change, the search for sustainability and debates around the value of place and meaning of the architectural gesture are aspects which will affect the cities we inhabit. This series seeks to address such topics, both theoretically and in practice, through the publication of high quality original research, written and visual. Topics to be covered include the following: Architectural history and theory and their relationship to the development of the discipline, building conservation, heritage and creative adaptation. The formal and aesthetic values of architectural design, the diversity of its expression of identity, and its representation in other media. The impact of technological innovation on the materialisation of architecture and the questions surrounding environmental sustainability, experimentation and visionary design The social and psychological context of architectural production, its relationship to occupants, clients and to other creative and professional disciplines, and the political situation in which it is commissioned. Proposals will be welcomed which explore or connect aspects of these themes. Subjects which deal with individual architects, with specific buildings or building types, and the critical interpretation of historical and contemporary architecture from a theoretical or philosophical perspective are particularly encouraged. Architecture's embodiment of technical, social, and aesthetic aspects will also be emphasised.